Golden State Laundry Systems are delighted to announce that our Fall Super Sale shows will be held in San Francisco on September 15 and in Los Angeles and San Diego on September 22. Come for the incredible prices, stay for the laundry business expertise! 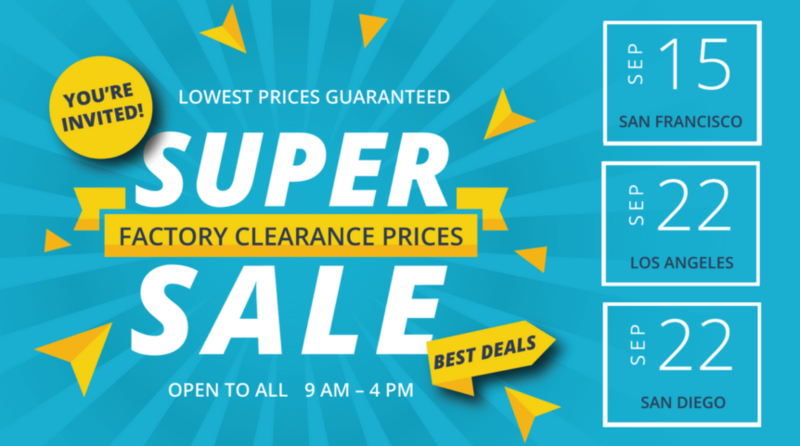 Get ready for incredible one-day-only price specials, on our commercial washers, dryers, and replacement parts. Our funding partners will be on-site with exclusive financing offers — same-day approval available. Be among the first to view the long-awaited, new-look Wascomat washers and dryers with upgraded scratch-and-stain-resistant stainless steel front panels. Golden State Laundry Systems are the California specialist in providing the highest quality commercial laundry equipment. We stock washers and dryers from the most respected brands in the industry — Electrolux, Wascomat, Miele, ADC, and Maytag. Our profit-boosting equipment is built for low water and energy consumption and long-term performance — come and take a tour! From programming equipment for optimum efficiency to simple fixes and installation tips, our experts will be on hand throughout the day to answer all your questions. If you’re interested in the laundromat industry, attending our Open House event is the best place to start your research! We are California’s #1 coin laundry experts. With decades of experience and many current and former laundromat owners on our staff, no one knows more about starting a successful laundromat business in California than Golden State Laundry Systems. Our Super Sale Events Are Open to All — Come Along & Bring a Friend!